In my younger days I lived in one of the thatched cottages that once stood on the site of the bus shelter at Finches End and it was a wonderful place to live and play even though the cottages were very basic with one room and a kitchen downstairs. I would like to add some details about the lower photograph above. This photograph appeared in the magazine “Village Affairs” November/December 2003 Issue as part of an article by the late Cecil Beadle. Details about the photograph came from a letter and phone call from Cecil. The late Les Izzard and his son Simon also gave me a lot of additional information. 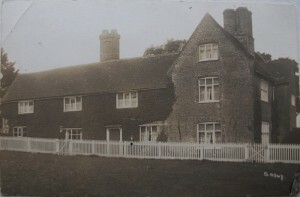 The location is either Astonbury Farm, Aston or possibly Mossbury Farm near Pin Green. The girl leading the horse is believed to be a Land Army member and if so dates the photograph to the years of the Second World War. The man standing by the nearside wheel of the traction engine is Jack Izzard, known as “Happy Jack” who lived in Aston. He was in charge of the threshing tackle shown which was originally owned by A.T.Oliver of Wandon End, near Luton. He was also involved with the steam ploughing engines named “Togo” and “Nelson” which also worked in this area. They were Fowler Class B4 Compound engines, makers numbers 10254 and 10255 respectively. The two men on the top of the Threshing Machine or Threshing Drum as it was called, are feeding the sheaves of corn into the machine to start the process of separating the ears of corn from the straw. The right hand man is my late grandfather Bertie Parker of Walkern. The process of feeding the drum has to be done all day long standing on equipment which is slightly rocking to and fro and avoiding dropping your knife or the sheaf strings into the machine! The sheaf also has to be put into the “drum” in a constant and even way to maximize the performance. The traction engine is an Allchin compound engine, works number 1427 of 7 nominal horse power, Colonial type with 6 foot rear wheels and a sprung rear axle. The engine was new to a Mr Dearman of Walkern in 1908.The registration number was NK 3184. The threshing machine is believed to have been made by Clayton and Shuttleworth. In the background an elevator is being used to start to build a straw stack from the threshed straw. If anyone has any information or photographs about steam ploughing or threshing in North Herts I would be very pleased to hear from them.